The Spanish Grand Prix (Gran Premio de España) is a Formula One race currently held at the Circuit de Catalunya in Barcelona, Spain, as part of the annual Formula One championship season. The first Spanish Grand Prix in 1913 was not actually run to the Grand Prix formula of the day, but to touring car rules, taking place on a 300-kilometre road circuit at Guadarrama, near Madrid, on the road to Valladolid. Motor racing events had taken place in Spain prior to that - the most notable among them being the Catalan Cup of 1908 and 1909, on roads around Sitges, near Barcelona. Both of these events were won by Jules Goux, establishing a strong racing tradition in Catalonia, which has continued to this day. This enthusiasm for racing led to the plan to build a permanent track at Sitges - a 2km oval which became known as Sitges-Terramar, and was the site of the 1923 Spanish Grand Prix. 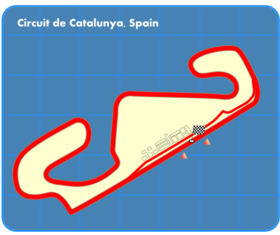 After this first race, the track fell into financial difficulties, and the main race in Spain moved to the Circuito Lasarte track on the northern coast (called the San Sebastian Grand Prix). Following the 1936 race, Spain descended into civil war and racing stopped. In 1946, racing returned to Spain in the form of the Penya Rhin Grand Prix at the Pedralbes Circuit in Barcelona. Spain did not return to the international calendar until 1951, joining the list of races of the Formula One championship, on the Pedralbes Circuit. In 1955, a terrible accident at the 24 Hours of Le Mans resulted in regulations governing spectator safety, and the pedestrian-lined street track at Pedralbes was dropped from the racing calendar. In the 1960s, Spain made a bid to return to the world of international motor racing - the Royal Automobile Club of Spain commissioned a new circuit north of Madrid at Jarama, and Cataluña refurbished their circuit at Montjuïc circuit in Barcelona. A non-championship Grand Prix took place at Jarama in 1967, which was won by Jim Clark racing in a Lotus. In 1968, Jarama hosted the Spanish Grand Prix, near the beginning of the F1 season. It was agreed, following this event, that the race would alternate between Jarama and Montjuich. The 1975 Grand Prix at Montjuich was marked by tragedy. There had been concerns about track safety during practice races, and double-winner Emerson Fittipaldi retired in protest after a single lap. On the 26th lap of the race, Rolf Stommelen's car crashed when the rear wing broke off, killing four spectators. The race was stopped later and won by Jochen Mass, though only half the points were awarded. The Spanish Grand Prix was confined to Jarama until 1981, after which it was dropped from the racing calendar. In 1985, the Mayor of Jerez commissioned a new racing circuit in his town to promote tourism and sherries. The track, the Circuito Permanente de Jerez, was finished in time for the 1986 championship, which saw a furious battle between Ayrton Senna and Nigel Mansell, with the two cars finishing side by side. The stewards awarded the win to Senna, by 0.014 seconds - one of F1's closest finishes. The 1990 Spanish Grand Prix was the last in Jerez (although Jerez did stage the European Grand Prix in 1994 and 1997). During the practice, Martin Donnelly's car was destroyed in a high-speed collision, and Donnelly was severely injured. Work on the Circuit de Catalunya was underway in Barcelona, and in 1991, the event moved to this new track, where it has remained since. The 1992 event was advertised as the Grand Prix of the Olympic Games. Events which were not part of the Formula One World Championhip are indicated by a pink background.